Preheat oven to 325 and line baking sheet with parchment paper. Combine egg whites, maple syrup, honey and salt in a pan over medium heat, stirring for about 1 minute. Then add coconut, teff flour, vanilla, and cardamom and continue to cook, stirring constantly until the mixture sizzles for about 2 minutes. Remove from the heat and let cool for a few minutes. Using teaspoon, form into 24 small mounds and bake for 25 minutes, until golden brown. Place dark chocolate in a glass bowl and set it over simmering hot water. Stir chocolate until melted, then remove from heat. 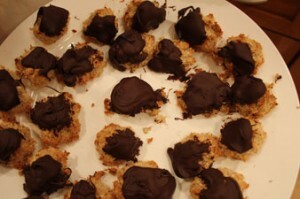 Dip macaroons into melted chocolate and chill in refrigerator until chocolate hardens. 1.Using your large food processor bowl and blade process all ingredients except chocolate chips until dough like consistency with visible chunks of nut. 2.Manually fold chocolate chips into crust. *These are delicious rolled in cocoa or coconut! **Peanuts can be substituted for almonds, and peanut butter can be substituted for almond butter. For the crust, blend almond meal and dates until mixture sticks together. Smash mixture into a 6-8 inch pie dish. Freeze for at least on hour. 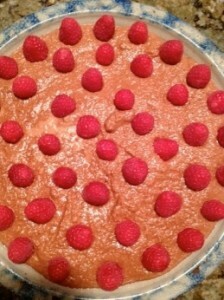 For the topping, blend strawberries and little maple syrup to adjust sweetness. Defrost cheesecake in the fridge until the center is cold. In a food processor, combine dates, cranberries, walnuts, peanut butter, coconut oil and ¼ cup cocoa powder. Line a baking pan (roughly 6 1/2 x 10) with parchment or and then spread the brownie mixture overtop, as evenly as possible using a small roller or the back of a spoon, press down gently to pack. Using the same blender or food processor, add: vanilla, banana, peanut butter, maple syrup and cocoa powder until mixture is well blended and the frosting develops a nice creamy texture. Place pan in freezer for about 45 minutes to one hour until mixture has set. 1. Place all ingredients in your food processor and pulse to combine. Preheat oven to 350 degrees. Grease the bottom and sides of a 9×13-inch glass pan. Combine pecans, dates, orange zest and juice, cinnamon, and salt in small bowl. Core apples, leaving half an inch at the bottom and peel top edges. Stuff apples with pecan filling. Put apples in baking pan, pour in about 1 inch of apple juice and cinnamon stick. Cover tightly with foil. Bake for 40-60 minutes, until apples are tender but not mushy. Test for doneness by poking fork into apples, should be tender. Serve warm and drizzle with cinnamon apple juice from pan.